SPDIF is a standard for transmitting high-quality digital audio without going through an analogue conversion process. It is used for connecting Hi-FI Equipment, DVD players, CD players, Mini-Disc Players, Sound cards etc. 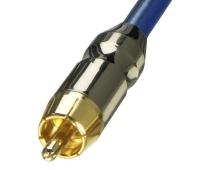 This interface uses RCA phono connectors and 75 Ohm coaxial cable. 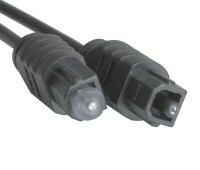 This interface uses fibre optic cable and is available with two types of connectors - TosLink (shown left below) and Mini Optical (shown right). 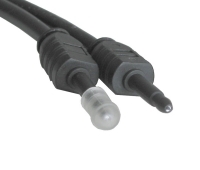 Mini-optical connectors are sometimes called Mini-Toslink, MiniPlug or Mini Optical jacks, but they all refer to the same connector, as pictured above! The mini-optical connector is typically used on portable CD and MD players, but it is also used on other audio devices. The TosLink connector is commonly used on DVD and CD players, DAT recorders, surround sound receivers etc.